Last updated on April 15th, 2016 at 01:23 pm. I don’t know how anyone can go through life let alone work on a job site without a knife. A pocket knife is the one tool that every person will probably use on a daily basis. Choosing the knife that works best for you and increases your productivity is a worthy task. If you don’t have one yet, hopefully this review will help you in your search for the best electrician knife . There are few different blade types electrician’s use in the trade. Coping blade: A coping blade has a straight spine and blade, that creates parallel lines running to the point. The spine tapers toward the tip so a thin, sharp point is created. This blade is a good cutter at the tip and opens boxes well, skimming/stripping small wire or cables, and can make cuts in tight areas or curved cuts. Sheepfoot slitting blade: The sheepfoot is similar to the coping blade in which the spine and edge run parallel from the handle. The difference between the two however is the drop from the spine to the tip. It has a rounded curve on the sheepfoot rather than an angle as on the coping blade. The blade also thins as it approaches the tip and makes it useful for detail work. This blade is ideal for heavy-duty line work or stripping large gauge wire. Spearpoint blade: The spearpoint blade is a straight blade with a single sharpened edge. The top of the blade has a false edge near the tip and the top and bottom of the blade fall and rise equally to create a point at the equator of the blade. The variations on this blade consist mainly in the point, with some being more blunted as in traditional pocket knife examples, or sharper more pointed tips as in tactical knife examples. Utility knife / Box cutter: A utility knife is a knife used for general or utility purposes within the construction and trade industries. The utility knife usually features retractable and/or replaceable blades made of either die-cast metal or molded plastic. Knives are a personal thing. Everyone has their own unique taste and requirements when they look for tools, knives, gadgets, phones, etc. When you’re trying to find the best electrician knife, there are a few things you need to consider. Size – When searching for a knife, size does matter. I’m not trying to carry around a Crocodile Dundee Bowie knife while trying to pull wire and bend conduit. A pocket knife needs fit easily in the palm of my hand and be easy to handle. I hate knives where I’m constantly fiddling with how I’m holding it to get the best angle for the task at hand. Accessibility – This might be the most important requirement for me. When I need a knife, I need it right now. Not 6 seconds later after digging around in my pants pocket. To me, accessibility means quick draw. Which narrows my requirements down to knives with clips. I usually carry my knife either clipped inside my right front pocket or my right back pocket next to my wallet. Since I’m right handed, this works best for me. You may choose to carry it elsewhere, but as I said before, these two locations work best for me. Remember, a pocket knife should be sized and designed to slip in your pants pocket for easy access and to help you increase your productivity. Disappearing Knives: A pocket knife can walk away from you. When you loan it to a co-worker, friend, or wife, you might as well be giving it away. When you’re busy doing work and someone asks to borrow it tell them nope. Unless they have a box in front of you and you can open it for them – Don’t let them borrow your knife! Your knife should never be anywhere except your hand and your pocket – don’t ever put it down. When you’re done using it – put it back in your pocket or tool pouch. Get in the habit of doing this. It’ll prevent you from scratching your head when your knife comes up missing. Pick Your Price: Now you need chose a maximum amount you’re willing to pay for a knife. My range is no more than $50. I’d be really upset if I dropped some coin – like $200 on a Benchmade and lost it. Despite how careful you are with your knife, life happens and things break or walk away. If you find a good deal, think about picking up two and keeping one in your toolbox. The sheepfoot (sometimes called a Hawkbill) is an ideal tool for stripping large gauge wire with thick insulation. If you’re working as an apprentice inside wireman or lineman working with large gauge wire, this knife can make your life much easier. The advantage to using the sheepfoot is the hook prevents accidental slipping as you’re scoring and cutting the insulation. It’s designed to remove insulation easily and keep you safe. Insert the tip of the blade into the outer insulation and slice to the end. Cut around the conductor to easily peak the first layer of insulation off. First layer removed. Slip off insulation and trim off copper sheath. Repeat the first two steps on inner insulation. See how thick the insulating material is? This is how it looks when the conductor is ready for a lug or termination. Blade: The blade length is just over 2.5 inches and is made of AUS 8 stainless steel, which has been hardened to 58-59 RC. The RC stands for Rockwell Scale which measures the hardness of different types of metals. The 58-59 rating falls within the RC very hard steel HRC 55–66 range. This range is where you would find chisels and quality knife blades. The blade comes sharpened from the factory and will hold it’s edge for a good length of time. As with any knife under continuous use, it will need to be sharpened occasionally. Just like the name suggests, this knife blade locks into place. The release is quite common among locking blades – pushing down with your thumb unlocks the blade, perfect for one handed operation. Reversible thumb stud allows for easy one-handed opening. The handle is made of an impact-resistant nylon resin and has a rubber insert. This helps keep the blade from jarring loose if you drop it or it gets run over by a fork lift. Also, the reversible thumb stub is great for lefty’s – we all know they have it harder than the rest of us. Customer Reviews and Score: The Klein Tools Lightweight Lockback Sheepfoot Knife has 16 reviews with an average rating of 4.9 out 5 stars from Amazon. The only drawbacks to this knife is it doesn’t include a belt clip and as one reviewer put it, “could cost about $10 less ten dollars less in my opinion.” In my opinion, an extra $10 to save time and frustration for years to come is worth it. Conclusion: If you’re working as an apprentice inside wireman or lineman, and splice cables, the sheepfoot knife could make your life much easier. It can help you make more consistent cuts, saving you time by not having to repair nicks in wire. Another positive is using this knife versus a utility knife is there aren’t any blades to change. There’s only one blade that’s easy to sharpen when dulled and made to the highest standards of quality from Klein Tools. This knife meets my requirements for best electrician knife for specialty use. This thing is a beast of a utility knife. The Milwaukee Electric FASTBACK Knife with storage is very effective, compact enough to carry in your pocket, and well-designed metal bode. Typical to all FASTBACK Knives from Milwaukee it promotes a one-handed “press and flip” operation for quick applications. It also houses an extra blade within the handle that opens for easy removal. The extra blade is held inside by magnets and doesn’t require any tools to release the blade. Blade: Standard utility blade feature – it ships with 2. The gut hook on the handle helps you slice through plastic banding with ease. Also featured is the handy section to strip wire up to #10 gauge. Always a helpful feature that any electrician would be happy to use in a pinch. Conclusion: The triple cutting features of the FASTBACK Utility Knife is ideal for any electrician who’s looking to increase productivity. This knife is something more substantial than a utility razor blade, it’s not expensive, and durable for any job site. This is the ideal pocket knife for day to day use. It features a one-handed press-and-flip operation which helps you to open the knife faster – right when you need it. The large wire clip on the side has strong tension for maximum hold, but still makes it easy to slide the knife inside your jeans pocket with the clip on the outside – versus having to use a case. If you’re a lefty then this may not be the knife for you. The push button is located to serve right-handed uses, unfortunately leaving you guys high and dry. Conclusion: The Milwaukee FASTBACK Folding Flip Pocket Knife was made for someone who uses a knife every day. You can slice your way to maximum productivity on the jobsite with the push button-quick flip. No more two-handed, awkward fiddling with the knife to get the blade open. The slim, lightweight body takes up less space but still stands up to everyday abuse. BEST BUY – Combo Pack! You can pick up the Milwaukee Utility Knife and Pocket Knife for less than $40 with free shipping for Amazon Prime members. This 2 blade Klein pocket knife is a great electrician’s knife for general cutting, wire stripping, and a screwdriver tip for opening hinged panels or junction boxes. The handy screwdriver-tip and easy to sharpen blade makes for quick work on any issue that pops up. Blades: This knife only has two blades – one for cutting and one with a screwdriver tip. Both blades measure 2.5 inches long and with a closed length of 3.75 inches. Both blades are made from carbon steel – a mixture of iron and carbon. This means that it can rust. However, if you keep it out of the rain or wipe it off when it gets wet you shouldn’t have any issues. Another good point of carbon steel is that it’s resistant to use and wear – much more than a stainless steel blade. You’ll still have to sharpen it, just not as often as stainless. If you’re into a stainless steel knife Klein also offers this pocket knife in stainless (1550-42) as well. One thing to note is the handle is not made of wood – its a wood grain plastic. So if you were expecting a 100% vintage style electrician knife I would say you have it, minus the real wood. Klein offers a lifetime warranty on material defects. You will need to request a WRA or Warranty Request Authorization using this link. Customer Reviews and Score: The Klein Tools Spearpoint 2-Blade Pocket Knife has 29 reviews with an average rating of 4.5 out 5 stars from Amazon. Two negative points the knife had was the knife could be hard to open and the loop attached to the handle. The blade being too hard to open could be a number of different things. Maybe the knife they had before was easier to open or it was a defective product. You never know. As for the loop on the handle, from what I read the reviewers that didn’t like it cut it off. Personally I see the loop as a selling point. Not only does it help fish the knife out of your pocket, you could tie a small lanyard on it for easy removal from a tool pouch. Conclusion: Like I said before, the Klein 2 blade Spearpoint is a top knife for any electrician. It’s great for general cutting, wire stripping, and opening equipment panels or boxes. Despite the negatives I pointed out, this is a simple knife that has more than one function and good usability. The Tenacious by Spyderco is a mid-sized plain edge knife that has a black G-10 laminate handle, designed with user friendly cutting in mind. Behind the laminate handles are steel liners that help increase the handle’s strength without introducing extra weight and thickness. Blade: The Tenacious has a 8CR13MOV stainless blade that looks similar to tear drop in shape. The spine of the blade is ground flat all the way to the cutting edge for increased handling cutting performance. Instead of having thumb stud the Tenacious utilizes an over sized round hole to set your thumb against to help flick open the blade. The spine is also textured which allows you to position your thumb for slip-proof confidence when cutting open boxes or for precision work. The knife also features a Walker Linerlock (with jimped liner). To unlock the blade you simply push the lock away from the blade. Another cool feature is the 4-way pocket clip which lets you set your carry preference: tip-up/tip-down left-hand/right-hand. Conclusion: This is the kind of knife you will actually use and not worry about beating up. Out of the box the Tenacious has ZERO blade play in either direction, and even after using it all day long it will still lock up tight waiting for it’s next mission. 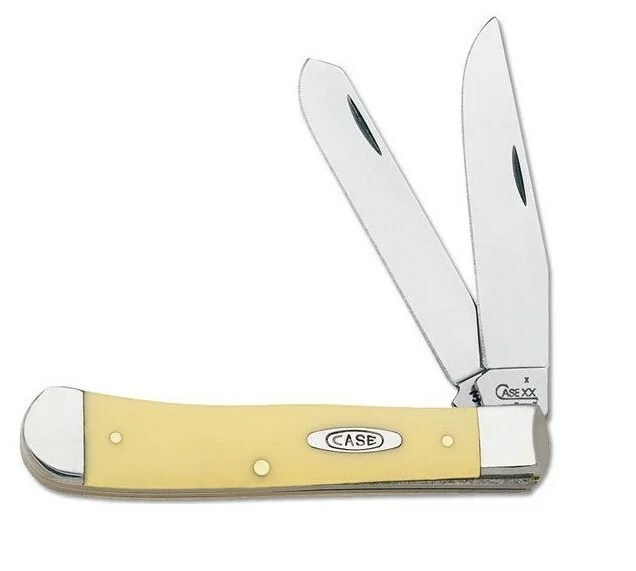 The #161 Case Trapper Pocket Knife has been a favorite of farmers and other working men since W. R. Case and Sons Cutlery started production in the 1920s. The Case brand of jack-knife is made entirely in the U.S. which is important to a lot of knife owners. It’s not only a versatile tool for use around the house, it’s a knife that has a long tradition of providing the working man with a tool he can count on daily. Blade: This knife has two blades – the clip and spey. Both are typically utilized for skinning animals and game. Talk about multi-purpose on the job site! If you find yourself in a death stare with a squirrel, you’ll be pleased to know that you can have it easily skinned and on a pit during your lunch break. Neither blade has a locking mechanism. The knife blades are made of chrome vanadium (CV) which is a special formula of alloyed cutlery steel known for its ease of re-sharpening. A CV blade requires your care to keep it looking sharp. A thin film of oil should be kept on the blade to maintain the steel finish and prevent rust. A quick touch-up will bring back a chrome vanadium blade’s original sharp edge. The grip panels are yellow Delrin, a type of thermoplastic used in the most demanding applications where the ultimate in toughness combined with high strength, creep and fatigue resistance are required. Customer Reviews and Score: The Case Cutlery 161 boasts a solid 4.7 out of 5 stars with 66 reviews. The worst reviewers stated that the knife rusts. But like I said before, this knife takes a bit of oil to keep the blade shiny, pristine, and rust free. If you are willing to do the additional maintenance, they hold an edge better and some claim its sharper than other generic knives on the market. Conclusion: The Case Cutlery is a great knife worth every cent. It’s the perfect knife for all occasions, especially if you’re an outdoorsman. Remember, this is not a cheaply Made in China knife! I have had really good luck with Gerber knives in the past and if you want a sharp, small, light weight pocket knife that you won’t realize is in your pocket, the Gerber LST is the one to buy. The LST holds an edge well and sharpens quickly when needed. Since this knife doesn’t come with a pocket clip, it’s either in your tool pouch, tool box, or pocket. What I really like about this knife is that it doesn’t make big bulge in pocket when you carry it. Blade: The LST blade is a common drop point design made of 420 HC stainless steel. The HC stands for “high carbon” and it can be brought to a higher hardness than 420 and should not be mistaken for it. Buck Knives stopped using a higher grade 440 stainless because of user complaints of sharpening and now exclusively uses 420HC. The Gerber LST boasts a solid 4.8 out of 5 stars with 169 reviews from Amazon. One complaint was that the blade worn down too fast (it was the only review I could find with this problem). Another complaint was the size of the knife. If you’re looking for a military spec-op type of knife then you may want to pass on this particular one. It’s barely over 3.5 inches in length, which for some people is a no go. Personally, the size works for me. Since it doesn’t come with a clip, when I go out I don’t want it the outline of a knife on my pocket. The Gerber LST is super versatile. It’s small size and sharp blade make it ideal for tradesmen, hunters, military, and outdoor situations. It’s currently selling for less than $20 on Amazon. Have you found a better knife that you think should make this list? Leave a comment so we can all take a look.